Docker deployments can be very dynamic with containers being started and stopped, moved around the YARN or Mesos-managed clusters, having very short life spans (the so-called pets) or long uptimes (aka cattle). Getting insight into the current and historical state of such clusters goes beyond collecting container performance metrics and sending alert notifications. If a container dies or gets paused, for example, you may want to know about it, right? Or maybe you’d want to be able to see that a container went belly up in retrospect when troubleshooting, wouldn’t you? Just two weeks ago we added Docker Monitoring (docker image is right here for your pulling pleasure) to SPM. We didn’t stop there — we’ve now expanded SPM’s Docker support by adding Docker Event collection, charting, and correlation. 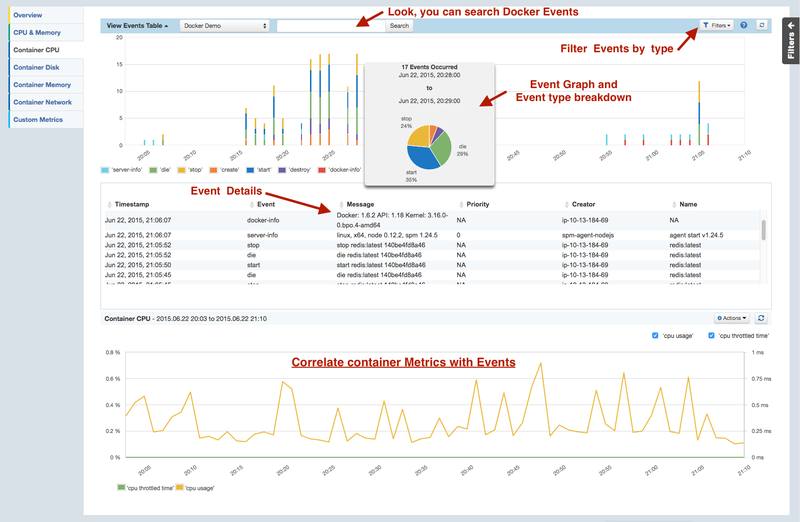 Every time a container is created or destroyed, started, stopped, or when it dies, sematext-agent-docker captures the appropriate event so you can later see what happened where and when, correlate it with metrics, alerts, anomalies — all of which are captured in SPM — or with any other information you have at your disposal. The functionality and the value this brings should be pretty obvious from the annotated screenshot below. Every time a Docker container emits one of these events sematext-agent-docker will capture it in real-time, ship it over to SPM, and you’ll be able to see it as shown in the above screenshot. Oh, and if you’re running CoreOS, you may also want to see how to index CoreOS logs into ELK/Logsene. Why? Because then you can have not only metrics and container events in one place, but also all container and application logs, too! If you’re using Docker, we hope you find this useful! Anything else you’d like us to add to SPM (for Docker or any other integration)? Leave a comment, ping @sematext, or send us email – tell us what you’d like to get for early Christmas!